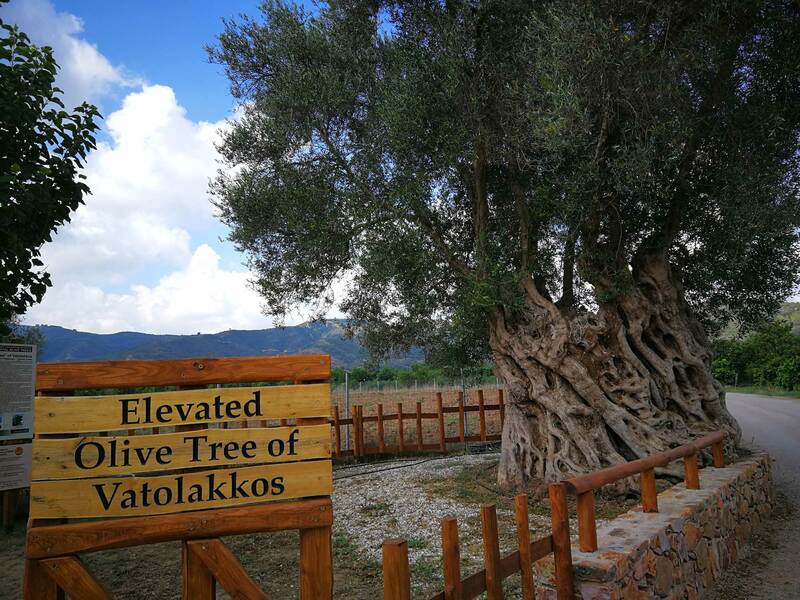 The Elevated Olive Tree of Vatolakkos is one of 14 ancient olive trees scattered around Crete declared natural monuments by the Association of Cretan Olive Municipalities (ACOM). 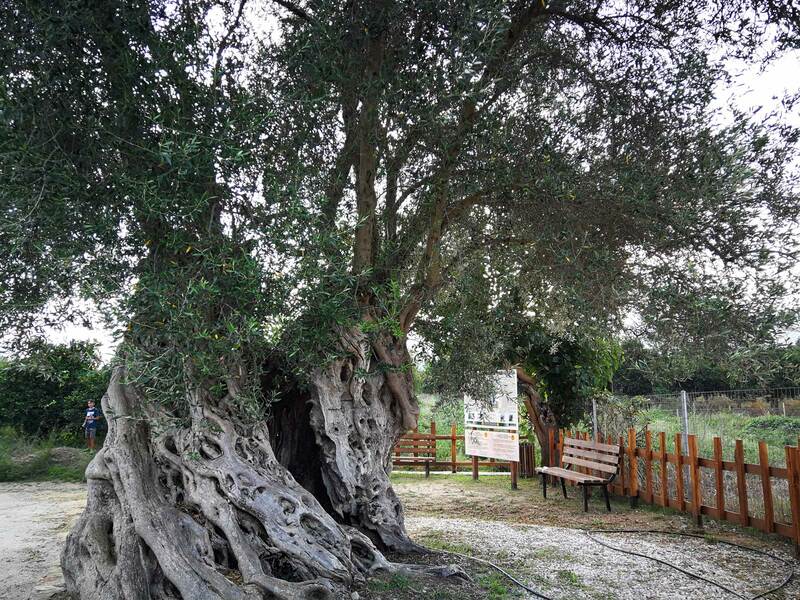 It is a 2000 years old tree, the only one of its kind still preserved on the island. 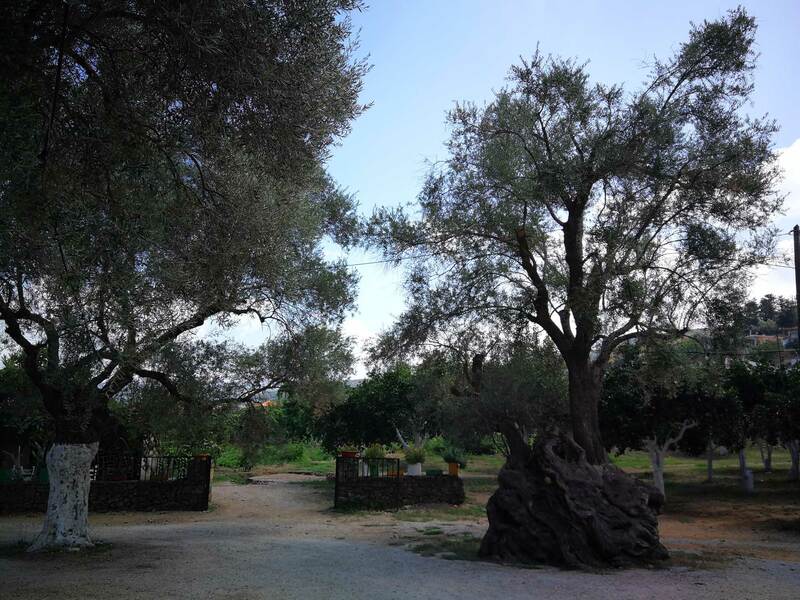 The Elevated Olive Tree of Vatolakkosis from the Olea Europea variety Mastoeidis, which locally is known as Tsounati. 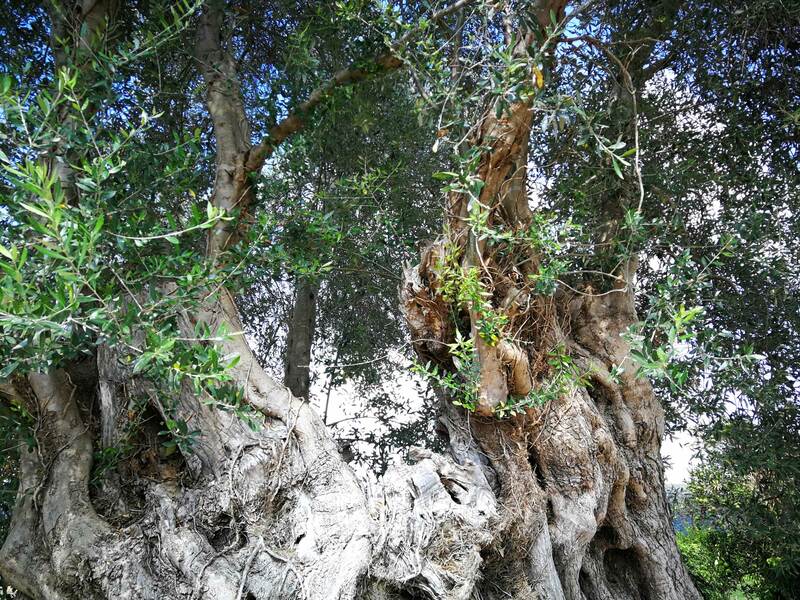 It was grafted about 2000 years ago – based on the perimeter of the trunk – on the rootstock of a wild olive tree, the Olea Europea var Oleaster. The name of the tree refers to the religious term “elevation,” which describes the ritual raising of the consecrated bread and wine during the celebration of the Eucharist. The trunk of the tree itself has grooves and holes associated with religious rites. Elevated Olive Tree of Vatolakkos – closeup of the trunk. For example, years ago the village priest bored a hole in the trunk of the tree and filled it up with incense, then closed it with a cork. Later on, when people tried to cut the tree, their saws broke. This is perhaps how the tree gained its sanctity for the residents of Vatollakos who often pass by making the sign of the cross. 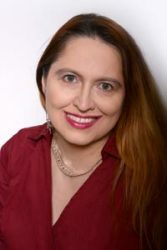 But, according to Dr. G. Ekaterinidis, Director of the Ethnographic Center of the Academy of Athens, the “elevation” was placed and sealed in holes of the trunk during a religious ceremony meant to protect the village against disease epidemics. The Elevated Olive Tree of Vatolakkosis not the only monumental tree in the area. The second grows in the gardens of the Manousakis Winery and it’s 1200 years old. Like its older cousin, the tree of the Manousakis is a protected natural monument. 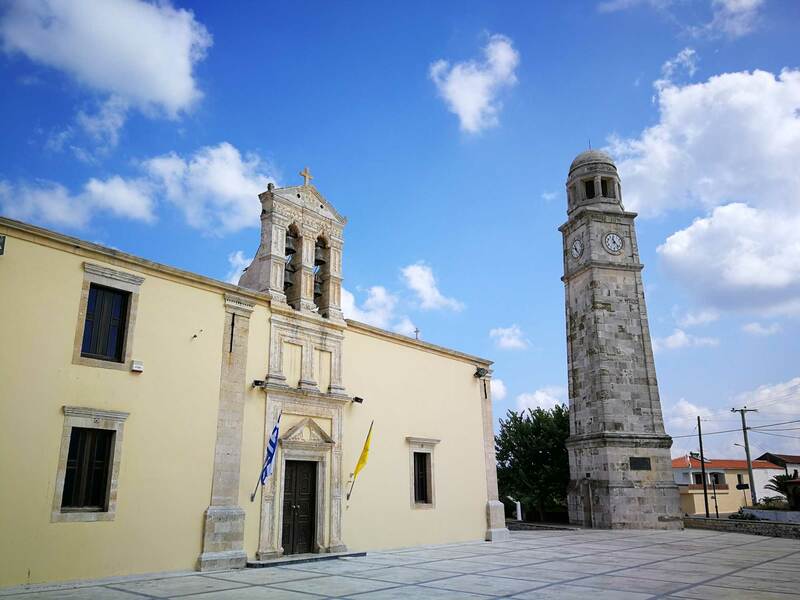 There’s also an Olive and Oil Museum in Vatolakkos, but to visit it you must email museumoliveoil@gmail.com or call +306946920923 at least 24 hours before your visit, or you will find its doors locked. But it is worth it to see it: dating from the 18th century, the building is the oldest of the six oil factories that existed in the village. The olive trees and the museum are not the only attractions of the village. The River Path Valsamioti is perfect for those who love nature walks and hikes. Dominating the main square, a 14th-century church dedicated to Apostles Peter and Paul stands in modest majesty near the monumental clock tower that commemorates the villagers killed by the Nazis. And then, there’s the Manousakis Winery, of course, which is another treasure of the village. Here, you can taste some of the finest wines available on the island, in a peaceful, atmospheric garden. A review of their tasting tour will be available soon on our website. In the meanwhile, consider Vatolakkos the best stop to understand the rich history behind the Cretan olive oil making tradition. It does go back to Minoan times, and the precious aliment is still considered “liquid gold” on the island – just like Homer once described it in his Odyssey.